Why did He send them out to discover what they already knew? (Recap) I think for two reasons. I think He wanted to teach them Reality #1 of the Altared Heart. And I think He wanted to introduce them to leader inadequacy. Reality #1 of the Altared Heart is this: You must do what you cannot do with what you do not have for the rest of your life. Did you get it? You must do what you cannot do with what you do not have for the rest of your life. Jesus is never going to give you any assignment you can do on your own. He will only give you assignments that force you to radically, desperately depend on Him. You must do what you cannot do with what you do not have, and it will never change, for the rest of your life. You know I find it fascinating, I think the Lord uses a pattern, follows a pattern in our lives in which early on, maybe we're brand new believers, maybe we're just starting to grow, maybe we've made that radical decision, I will put my heart on the altar and the Lord says, yes, that's where I want it. And He begins to bless us and use us and maybe we're just, you know, out of training or come into ministry and we're full, we're fresh and seeing all kinds of things happen and we're seeing our methods working and then one day it seems as if we hit the inadequacy wall. It seems as if we run into a wall and we ask ourselves, "Well, well, wait a minute, wait a minute, where did that come from? I had no idea that that was there. I just looked up a little bit ago and it wasn't there and wham, nothing that has been working is working!" Have you been there? You saw success and now all you can see is a wall. You know, I think our Lord gives us that encouragement because He wants us to know, you have gifts, I have blessed you, I intend to use you, but I intend to do something through you that is so far beyond anything you could ever think or imagine that I have to have your attention. And I have to help you understand the inadequacy wall. Now we get to that wall and, wham, we run right into it. And we don't know what to do. So we take a look at the wall, maybe we feel it, trying to figure out how to do it and we say, "O.K., there has to be a way through this wall…where's the door?" We go out and feel all around. It's hidden. Huh! We work…after a while we realize there's no door. "O.K., so here's what I'm going to do, I'm going to go over that wall. I'm going to climb up that wall." So we start to climb, problem is two fold. One, hard to get handholds. Two, the higher we climb, the higher the wall gets. "Huh, uh oh, this is not working. All right, then I will go under that wall. Where's a shovel? Let's start digging, digging, digging." You know what? The deeper we dig, the deeper the wall gets. "Huh. Well, let's go around the wall. It's a long walk, but I've got to, I have to get past this wall." So we walk this way, then we walk this way. The longer we walk, the longer the wall gets. So we try, we try, we try, and we try. We're like the disciples. Walking among the five thousand, trying to find enough bread already knowing, there's not enough bread! If these people had food, they would've eaten it. There is not enough bread. So, we go out looking. "Let me try, I'll find something new, something I've never done before." We go to conferences, we go to workshops, we read books, we do all that and we try these new things and they give us a little bit of hope. Some of them are really good. But the wall is still there. Well then, we reorganize. I mean, organization is the solution to everything, isn't' it? Absolutely. So we reorganize. And we get that fresh wind of new organization. New opportunity. New flag to be taken. New…soon becomes old. We're still inadequate. So then we're desperately searching for what works. Anything. It doesn't matter what it is. "If it works, I will try it!" No…nothing works. So we quit. We just quit. We're done. We withdraw. We start to look around and we realize, "You know what, I'm not the only one here, that's a pretty crowded wall." I look over there, that's a friend. I look over there, oh, that guy's worse off than I am and she's really struggling! And we withdraw. And we end up protecting ourselves. And after a while we realize, you know everybody around us is like this. 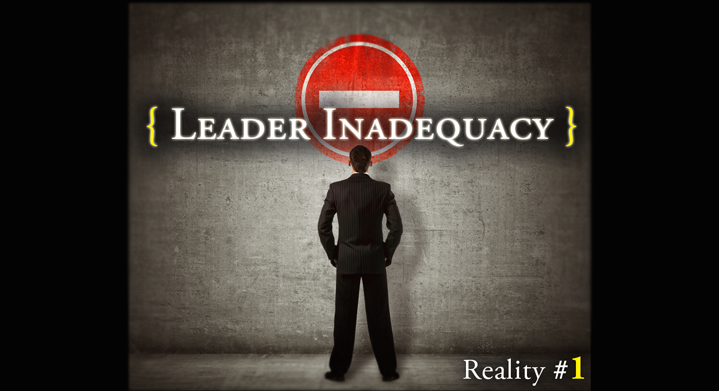 We're all at the wall of inadequacy. We're all pretending and protecting. So you know what we do? We work on our smile. Every Saturday night we work on our smile. It's the Sunday morning Christian smile. "Oh, hi, how are you? Oh, brother, everything is really great!" And we realize everybody has got that same smile because we're all in the same place. We've quit. We've given up. We've accepted the wall. But that's not at all what the Lord wants. The Lord wants us on the other side of the wall and the question is how are we going to get there? And the answer is, only through the Cross. Everything we will teach you in LeaderVision, everything that we will teach you in the Seven Realities of the Altared Heart will bring us to the same place. Only through the Cross. Only the Cross gets us through the wall.